Ten green bottles hanging on the wall! 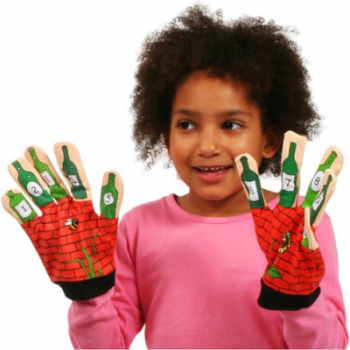 Manufactured in a soft stretchy fabric with superb printed detail, the mitts are suitable for both adults and children to use. Each mitt has a pocket on the back of the hand to hold, for example, self made number matching cards (not included). Not suitable for children under 12 months. Please remove all hooks, labels and packaging before giving this product to a child. Dimensions: Height: 23 cm.